This is another of Andreas's novelty models. 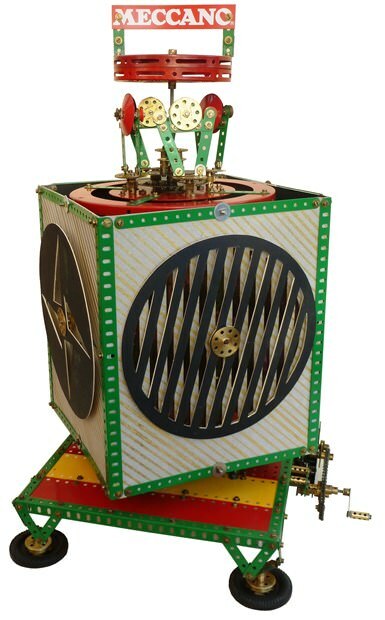 It consists of a large cardboard box supported on an angle girder framework which revolves and is driven by a clockwork motor. The sides of the box are fitted with different cut out discs that also revolve. It needs a fair amount of patience to construct each of these. The illumination is via a pair of 240 volt light bulbs. If you think of the old glitter balls in a dance floor, this is the effect. Obviously it is better to demonstrate this model in a darkened room to get the full effect.